CLEMSON -- Brad Brownell didn’t seem worried on Tuesday when he began talking about his team’s shooting woes during their three-game winless start to ACC play. The defensive intensity had been there for the Tigers all along in tough losses against Duke, Virginia, and on the road at Syracuse. But even Brownell at times saw his group start to press when the ball simply wasn’t falling through the hoop. “We’re going to break out of it,” Brownell said of the slump. And nobody breaks out of a shooting slump like senior guard Marcquise Reed. Clemson was able to capture its first ACC win of the season with a 72-60 victory over Georgia Tech. It was Clemson’s fourth consecutive victory over the Yellow Jackets, who have not won in Littlejohn since 2005. Wednesday night was basically Marcquise Reed and then everyone else. He poured in a career-high 30 points and didn’t come out of the game once. Probably for good reason, as he shot 10-of-13 from the field and also collected six rebounds. Georgia Tech head coach Josh Pastner knew it was going to be a scary day when his team arrived on campus. He saw Clemson’s recent struggles against a tough schedule and knew, at some point, the Tigers were going to get things going offensively. “Just hoped they would have gotten it going the next game,” Pastner said with a laugh. Clemson’s offense came into the game only making 33 of its last 107 shots. Tonight: 27-of-53 from the field (51-percent) in the confidence-building win. And the Tigers started off fast with a quick 14-0 lead right out of the gate. Clemson (11-6, 1-3) only made two shots in the first 12 minutes against Virginia, but against Georgia Tech, the Tigers made five of their first six shots. Reed had nine points during the run as Clemson grew its lead to as many as 19 points. The Yellow Jackets scrapped back and made things interesting with a 10-0 run going into halftime to pull within five points. But the story of the game was how Clesmon punched Georgia Tech in the mouth at the beginning of both halves. To start the second half, the Tigers responded to Georgia Tech’s run with a 12-3 run to push the lead back to 47-33. 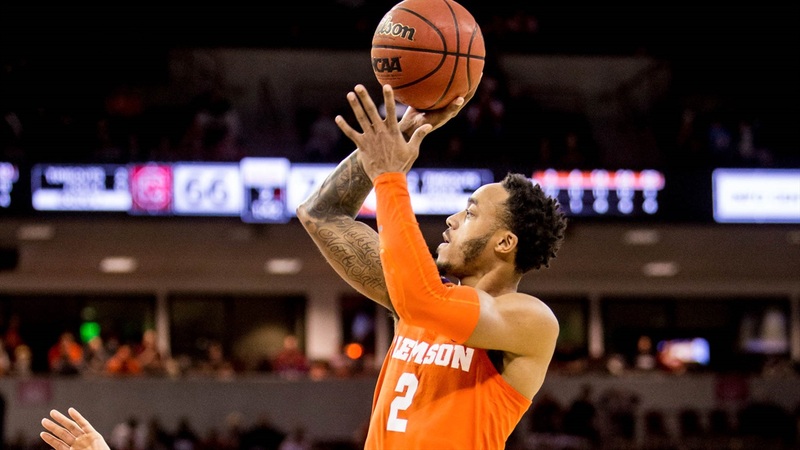 Clemson was able to hang on comfortably from there behind its stifling defense, which forced 13 turnovers and held Georgia Tech to 48-percent shooting, and Reed’s performance. In the words of his Twitter handle, Marcquise was off the leash throughout the game’s entirety. Coming into the contest, Reed had averaged 15 points and was 12-of-35 shooting combined in Clemson’s last three losses. Tonight’s career-high 30 points for Reed came on only 13 shot attempts. Reed proved, again, that when he’s able to find his spots on the floor early and often, it’s near impossible to stop him. Aamir Simms was 1 for his last 10 from three-point range and hit two three-pointers tonight to score 10 points, all of which came in the second half. David Skara also poured in 9 points on 3-of-5 shooting and Elijah Thomas ended the game in double-figures with 11 points and nine rebounds. Mitchell, who Brownell noted was hindered by his knee a little bit, only scored two points on five shots, but ended the game with nine assists and zero turnovers. All in all, Clemson’s game tonight was basically a must-win scenario with two tough road matchups upcoming, the first against Florida State on Tuesday after six days off. Brownell wanted to prove on Wednesday night that even though his team may have gotten knocked down a couple times in ACC play already that his team would respond. And respond they did by with high energy all evening - and spirit.